Aphrodite is the Greek Goddess of love and desire. The Romans called her Venus. Aphrodite loved and was loved by many gods and mortals. 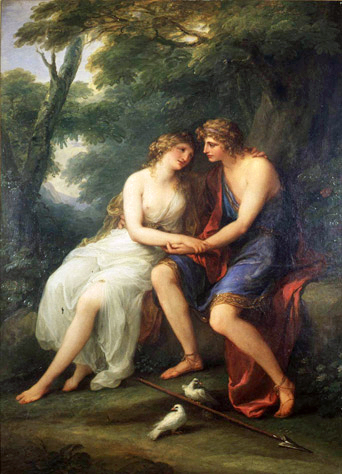 Among her mortal lovers, the most famous and passionate affair was with the handsome youth, Adonis. 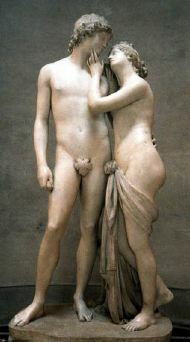 Aphrodite, playing one day with her son Eros (Cupid), wounded her bosom with one of his arrows. She pushed him away, but the wound was deeper than she thought. Before it healed she beheld Adonis, and was captivated with him. She absented herself even from Olympus, for Adonis was dearer to her than heaven. She followed him through the forests, rambling through the woods and over the hills, dressed like the huntress Artemis; and chased hares and stags, or other game that it is safe to hunt, but kept clear of the wolves and bears. She charged Adonis, too, to beware of such dangerous animals. "Be brave towards the timid," said she; "courage against the courageous is not safe. Beware how you expose yourself to danger and put my happiness to risk. Attack not the beasts that Nature has armed with weapons. I do not value your glory so high as to consent to purchase it by such exposure. Your youth, and the beauty that charms Aphrodite, will not touch the hearts of lions and bristly boars. Think of their terrible claws and prodigious strength! I hate the whole race of them. Do you ask me why?" Then she told him the story of Atalanta and Hippomenes, who were changed into lions for their ingratitude to her. 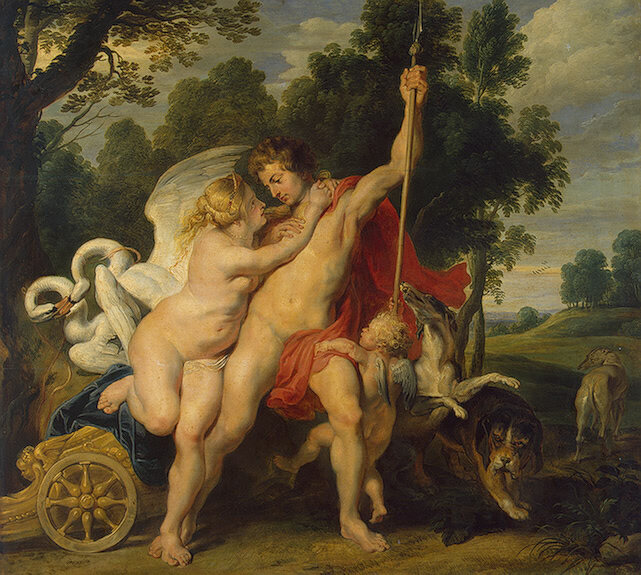 Aphrodite, in her swan-drawn chariot, had not yet reached Cyprus, when she heard coming up through mid-air the groans of her beloved, and turned back to earth. As she drew near and saw from on high his lifeless body bathed in blood, she alighted and, bending over it, beat her breast and tore her hair. Reproaching the Fates, she said, "Yet theirs shall be but a partial triumph; memorials of my grief shall endure, and the spectacle of your death, my Adonis, and of my lamentations shall be annually renewed. Your blood shall be changed into a flower; that consolation none can envy me." Thus speaking, she sprinkled nectar on the blood; and as they mingled, bubbles rose as in a pool on which raindrops fall, and in an hour's time there sprang up a flower of bloody hue like that of the pomegranate. But it is short-lived. It is said that the wind blows the blossoms open, and afterwards blows the petals away; so it is called Anemone, or Wind Flower, from the cause which assists equally in its production and its decay.